1X10^6 HeLa cells were stained with 0.2ug SLC2A1,GLUT1 antibody (21829-1-AP, red) and control antibody (blue). Fixed with 90% MeOH blocked with 3% BSA (30 min). Alexa Fluor 488-conjugated AffiniPure Goat Anti-Rabbit IgG(H+L) with dilution 1:1000. Glucose transporter 1 (GLUT1), also known as solute carrier family 2, facilitated glucose transporter member 1 (SLC2A1), is a uniporter protein responsible for the transport of glucose in many cell types and across the blood-brain barrier. What is the molecular weight of GLUT1? Is GLUT1 post-translationally modified? 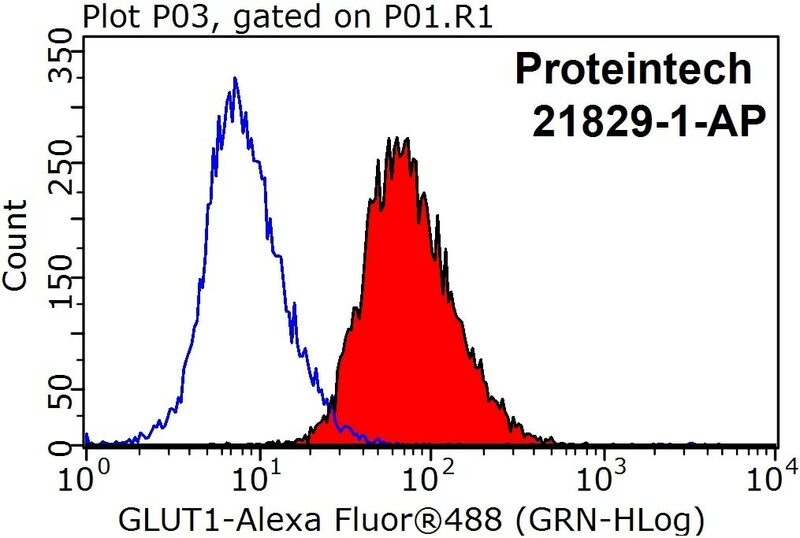 There are two forms of GLUT1 transporter that differ in their molecular weight. The 45-kDa form is found in glial cells, while the 55-kDa form is present in the endothelial cells regulating glucose transport over the blood-brain and blood-tissue barriers (PMID: 9630522). N-glycosylation of asparagine at position 42 is the only known post-translation modification of GLUT1 (PMID: 3839598). What is the subcellular localization of GLUT1? Glucose transporters, including GLUT1, are multiple-pass integral membrane proteins. GLUT1 is present at the plasma membrane but is also a subject of recycling between plasma membrane and endosomes. What molecules can be transported by GLUT1? The main substrate of GLUT1 transport is glucose, but it can also transport galactose, mannose, glucosamine, and reduced ascorbate. What is the tissue expression pattern of GLUT1? GLUT1 is expressed by many cell types but the highest levels are observed in erythrocytes and in the central nervous system (astrocytes). GLUT1 is responsible for glucose transfer across the blood-brain and blood-tissue barriers, including placental transport. Fructose 1,6-Bisphosphatase 1 Expression Reduces 18F-FDG Uptake in Clear Cell Renal Cell Carcinoma. The SIAH2-NRF1 axis spatially regulates tumor microenvironment remodeling for tumor progression. 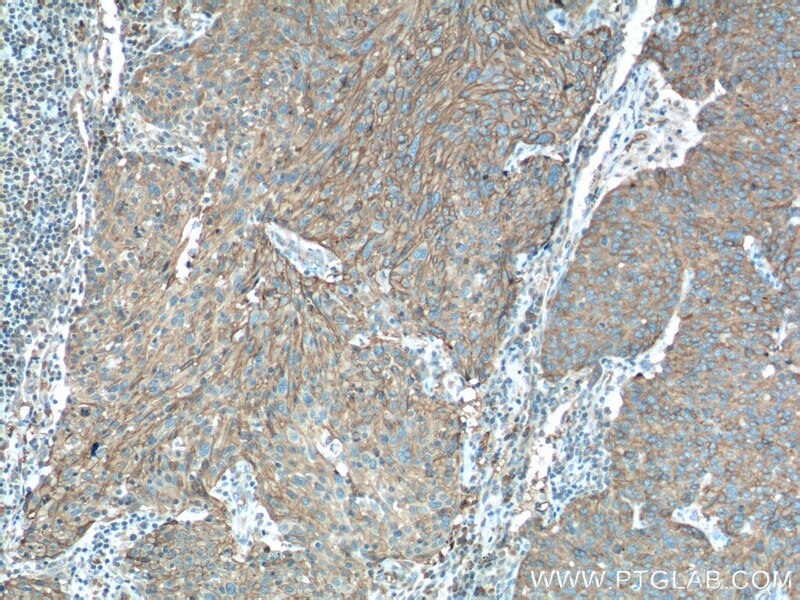 Immunohistochemical analysis of paraffin-embedded human lung cancer tissue slide using 21829-1-AP( SLC2A1,GLUT1 Antibody) at dilution of 1:200 (under 10x lens). 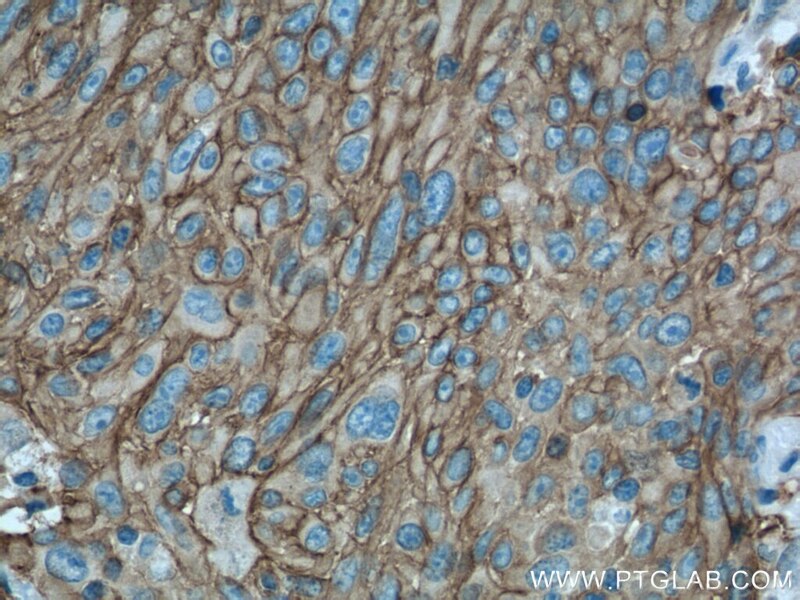 Immunohistochemical analysis of paraffin-embedded human lung cancer tissue slide using 21829-1-AP( SLC2A1,GLUT1 Antibody) at dilution of 1:200 (under 40x lens).